A system on a chip or system on chip is an integrated circuit that integrates all components of a computer or other electronic system into a single chip. It may contain digital, analog, mixed-signal, and often radio-frequency functions—all on a single chip substrate. SoCs are very common in the mobile electronics market because of their low power-consumption. A typical application is in the area of embedded systems. 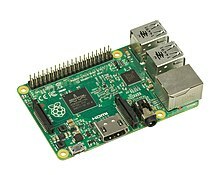 The Raspberry Pi uses a system on a chip as a fully-contained micro computer. A system on a chip or system on chip (SoC or SOC) is an integrated circuit (IC) that integrates all components of a computer or other electronic system into a single chip. It may contain digital, analog, mixed-signal, and often radio-frequency functions—all on a single chip substrate. SoCs are very common in the mobile electronics market because of their low power-consumption. A typical application is in the area of embedded systems. The contrast with a microcontroller is one of degree. Microcontrollers typically have under 100 kB of RAM (often just a few kilobytes) and often really are single-chip-systems, whereas the term SoC is typically used for more powerful processors, such as on smartphones. SoCs are capable of running software such as the desktop versions of Windows and Linux, which need external memory chips (flash, RAM) to be useful, and which are used with various external peripherals. In short, for larger systems, the term system on a chip is hyperbole, indicating technical direction more than reality: a high degree of chip integration, leading toward reduced manufacturing costs, and the production of smaller systems. Many systems are too complex to fit on just one chip built with a processor optimized for just one of the system's tasks. When it is not feasible to construct a SoC for a particular application, an alternative is a system in package (SiP) comprising a number of chips in a single package. In large volumes, SoC is believed to be more cost-effective than SiP since it increases the yield of the fabrication and because its packaging is simpler. Another option, as seen for example in higher-end cell phones, is package on package stacking during board assembly. The SoC includes processors and numerous digital peripherals, and comes in a ball grid package with lower and upper connections. The lower balls connect to the board and various peripherals, with the upper balls in a ring holding the memory buses used to access NAND flash and DDR2 RAM. Memory packages could come from multiple vendors. Being able to fit components other than just a CPU onto one chip has enabled huge advancements in mobile tech! Learn all about how it works in this episode. Difference between CPU, MPU, MCU, SOC, and MCM? System on a Chip Explained - What is SoC? Smartphone SoC?